It's only logical that one day after Trump accused China (and Russia) of playing the "currency devaluation game" in a time of rising Fed rates, that Beijing would respond by doing precisely what it was accused of, and moments ago the PBOC announced that effective April 25, China's central bank will cut the reserve requirement ratio (RRR) for qualified banks by one percentage point. The new targeted RRR will be effective April 25. The PBoC said that that the cut is for banks to repay MLF loans and will release about 400BN yuan of liquidity net (excluding the MLF repayment). 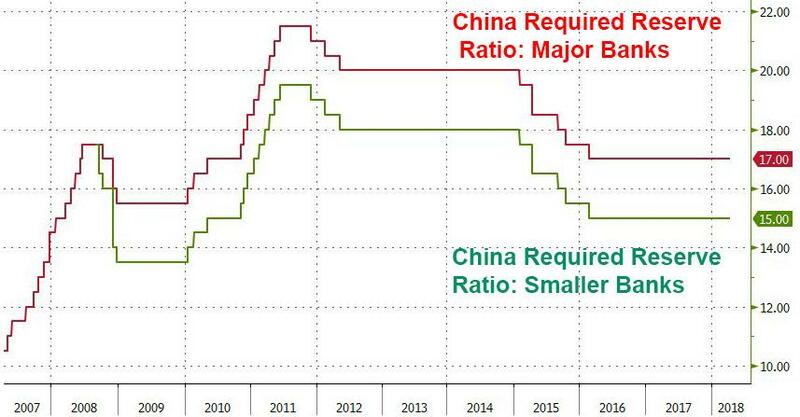 According to preliminary calculations, this targeted easing move is similar to what the PBOC did back in September 2017, when China cut the RRR by at least 50 bps; it marked the first RRR cut since February 2016. So far, there has been no reaction in the USDCNH which trades at 6.2750. And while overnight Q1 YoY GDP was reported as coming in at 6.8%, various analysts have echoed what we said here recently, raising concerns that Chinese growth may have peaked at this juncture. Growth of 6.8% year on year was unchanged from 4Q 2017 and in line with the consensus estimate. Relative to expectations of a continued slide in China’s growth, the stability in 2017 and that’s now stretching into 2018 tells a positive story. Even so, a slowdown in nominal growth, which we calculate at 10.2% year on year in 1Q, down from 11.1% in 4Q 2017 and a peak of 11.7% a year earlier, is a reminder that China will not stay in its sweet spot forever. Indeed, when it comes to the all-important deleveraging challenge, it’s nominal growth that is the more important gauge. The monthly numbers suggest a mixed end to the quarter. Industrial output and fixed asset investment both slowed. Retail sales accelerated. Looking forward, we continue to expect a modest deceleration in growth stretching over the course of the year, as slower credit expansion and -- potentially -- protectionist trade policies take a toll. Our credit impulse -- which measures the change in new credit as a share of GDP -- is now pointing firmly down. Still, from 6.8% in 1Q our 6.3% call for the year as a whole is looking too pessimistic and we will revisit it. As ever, the remarkable stability of China’s headline growth numbers raises questions about their value as a guide to the state of the economy. Since the start of 2015, GDP has moved in a range between 6.7% and 7%. A plausible story about current strength is that it reflects a rebound from a larger-than-reported slowdown in 2015.